Lineage: Combination of 2 audience tape versions from the same source. 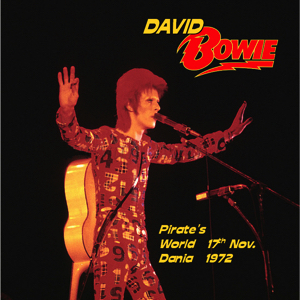 A historic gig amongst the Bowie community, the Pirate’s Cove show from 1972 showcases the first ever performance of a newly written Drive In Saturday, which is performed solo by Bowie on acoustic. This is one of the better quality existing Ziggy era tapes, and although the tape itself is a bit overmodulated, the sound is full. 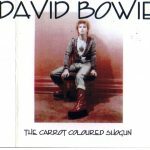 There are very few tapes that exist from the first American leg of the Ziggy tour, so for those interested in the history this is worth the download. I received this recording as part of a batch in the mid 80’s so perhaps it is lower generation, there is not a lot of tape hiss. After Hang on to Yourself Bowie says: “Good evening,my name’s David Bowie and these are the Spiders from Mars” to which some from the audience responds “Hi dave!” .The Spiders start tuning their instruments and Bowie does the announcement: This song called Ziggy Stardust“. After the number is finished there follows another round of tuning .and Bowie’s explanation “Ah,let me tell you that we’re all totally out of tune.Ha!. But we’re gonna play” is answered by someone from the audience calling “OK,allright,no problem!”. Bowie dwells upon the following number.Andy Warhol: “Thank you. When we got to New York we had a painter who had painted K. Bowles and Manlyn Monroe…” – the rest is not very intelligible. After Andy Worhol Bowie introduces a new song: “I’ve a now song for you I’d like to do very much. I wrote it on the tram from L.A to Chicago before I came down here and I tried to write it on the tram journey from Chicago to here. l’m not quite sure if I’ve learnt it yet ,so we’ll see won’t we”. The audiencee laugh and applauds. “l’ll tell you what it’s about because I didn’t understand it when I wrote it” Bowie goes on and the attentive audience laugh again. “This takes place in – probably in the year two thousand and thirty three witch is a good year,and in that time it was after a catastrophic time of war and many people didn’t know how to make love, and they learn to make love by watching the video film of the era of the nineteen seventies and the nineteen eighties”. Again the audience applauded,and Bowie start to sing Drive in Saturday with his own guitar as sole accomparument. This was the first time this number was played live,and Bowie turns out a splendid version. It is also quite special because it is acoustic.As likely as not Bowie played it more than once during this US tour,but this is the only tape of the tour that contains it. “Thank you” Bowie says after the number is over,and gets thunders of applause. “This is a number that was written by a band…..this is a New York band’s number and the band was called the Velvet Underground” Bowie says ,referring to Waiting For The Man,a cert in the ’72 US tour repertory. blared a la “Clockwork Orange” and there he stood – the incarnation of “gay rock”. into a red pantsuit. What a sight. That voice is a hard one to pin down in words, so conclusive is its quality. smoothness of the balladeer. It can turn raunchy when the music so demands. it derives from the Beatles and possibly Johnny Mathis. electric guitar textures that beautifully set off his voice. come on” with compelling intent. audience soaked up with delight. them would have been the same as 20; 45 minutes were absurd. arrests, and that the promoters were doing the searching. to have been for bottles, which have been thrown on stage in the past. is but little changed despite much ballyhoo about improving the facility. for the opening band, Ginger, who replaced Nitzfinger due to scheduling conflict. Combination of 2 audience tape versions from the same source. Version 1: by a private collector as 96 kHz/24 bit (first part of the show). Version 2: by learm as 48 kHz/24 bit (second part of he show). – There is still some hiss present but I decided to leave it that way in order not to remove too much of high frequencies. superior to version 1. Nevertheless version 1 had a better sound at part 1. – There are only ca. 2 seconds missing of the start of the second part of WOAC as in version 2 there is a slower fade in. In comparison to all other versions I know of this show this version has a much wider range of frequencies especially at higher frequencies as I have avoided to run an automatic hiss reduction process step. I know that some people would still prefer more hiss reduction but for me this version here represents a very good compromise between enjoyable frequency range and partly reduced hiss.